Stephen Eric Bronner’s The Bigot: Why Prejudice Persists, reviewed. Are Anti-Gay Activists Bigots? A Brilliant, Disturbing New Book Says Yes. 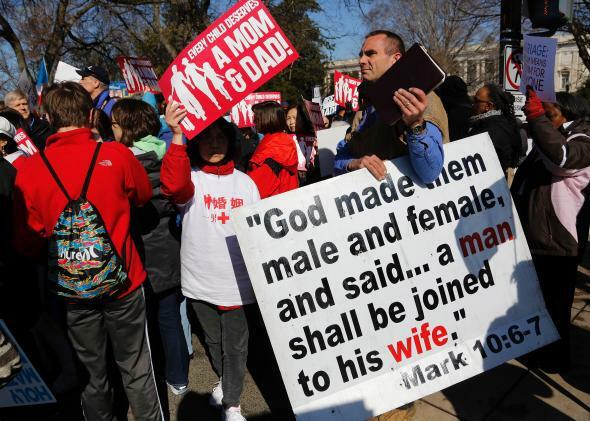 Anti-gay marriage protesters in front of the U.S. Supreme Court on March 26, 2013. Earlier this year, I took part in spirited debate about the nature of anti-gay animus with the Atlantic’s Connor Friedersdorf. I took the position that anybody who opposes equal rights for gay people is, by definition, a bigot; Friedersdorf struck back in a whip-smart rejoinder, insisting that we can draw a bright line between true bigotry and garden-variety homophobia. Friedersdorf and I went back and forth on the matter, but we never arrived at an answer to perhaps the most important question of all: What, exactly, is a bigot? In his brilliant and disturbing new book The Bigot: Why Prejudice Persists, Stephen Eric Bronner answers the definitional question in exhaustive, disarming detail. Bronner, who serves at Rutgers University’s Center for the Study of Genocide and Human Rights and on the UNESCO Chair for Genocide Prevention, isn’t just interested in certain niches of prejudice. His book is concerned with a deeper analysis of bigots themselves: Why they hate, who they hate, how they hate. And his startling conclusion is that bigotry in the 21st century isn’t withering away—it’s finding new targets and camouflaging itself better than ever. The bigot takes his arguments where he can find them. He is a bricoleur who uses whatever he happens to find along the way. Any text can be made to say anything and the more sacred the better. So while the bigot may be a “true believer,” he is also a pragmatist. He can twist mythologies, including religion and imagined tradition, to fit his needs in a thousand different ways. But behind the bigot’s beliefs is an all-consuming fear of modernity. It was modernity, after all, that gave minorities the tools to combat their oppression—which, in turn, led to the increasing marginalization of prejudiced holdouts. The bigot’s fight against modernity also allows him to disguise his biases as a principled conviction that minorities are, in Bronner’s words, “fighting against the natural order of things.” We see this casuistry deployed repeatedly in the right’s strange quest to smear and dehumanize trans people: Because conservatives have always believed in strict adherence to an unbreakable gender binary, that binary must be accurate. “Things are the way they are,” in Bronner’s succinct phrasing, “and they are that way for a reason.” If trans people could go millennia without demanding respect, they have no right to demand it today. Why are bigots so terrified of modernity and its enthusiasts? Simple: As minorities capitalize upon the 21st century’s enlightened cosmopolitanism, bigots feel their power slipping away. After anti-gay activists failed to pass a gay segregation bill in red-leaning Arizona, conservatives cried foul, arguing that the measure’s demise imperiled their own “religious liberty.” Their conception of “liberty”—the freedom to discriminate against gay customers—might not be shared by many mainstream Americans in 2014. But conservatives are desperate to cling to this “liberty” nonetheless; their right to deny gay people basic dignity, so uncontroversial for so many years, is tantamount to an assertion of power over the oppressed in the public sphere. With it, conservatives can cling to a shred of their former cultural dominance. Without it, their cause is revealed as a fraud. Marginalization isn’t the bigot’s only method of stanching the flow of social progress. Denying minorities’ existence—or at the very least, minimizing their struggle—will work just as well. Because humans are hardwired for empathy, we tend to treat others with some measure of compassion. But if Americans can be convinced that certain minorities are really overstating their plight, they may lose that sympathy. That’s why conservatives try to prove that gay people don’t really exist or are too rare to care about. These inane talking points undermine the urgency and gravity of the LGBTQ rights movement as a whole, making them valuable tools for anyone who wants to belittle the cause. [Resisting bigotry] involves clarifying the prejudices and privileges masked in policy debates so that everyday people can evaluate them appropriately. It also means holding those who disadvantage [minorities] and serve the bigot’s interests morally accountable. Too much hand-wringing has taken place over whether this or that person … is really a bigot deep in his heart. There has been a bit too much parsing of language and examination of attitudes, and not enough critical investigation of political policies. In other words, when a wedding photographer refuses to serve gay clients, it isn’t her outwardly polite demurral that matters—it’s the obvious prejudice that lies behind that demurral. Opposition to equal rights for gay people always constitutes homophobia, no matter how well the underlying animus is masked. To Bronner, combatting this temptation to let bigotry slide when it’s sugarcoated nicely is the chief challenge of this generation. “The bigot,” Bronner notes in his final, disheartening pages, “now employs camouflage in translating his prejudices into reality.” So long as bigotry is considered an acceptable viewpoint, it’ll find its way into the law books.